My grill pan has been my work-horse as of late; I pull it out almost every other day for searing peppers, potatoes, tomatoes and squash. It’s allowing me to celebrate summer produce every night in my kitchen. I’m so glad we get seasonal produce; a few months of eating asparagus, peas and artichokes have made me SO excited for the first tomatoes and eggplant of the year. And, I know that right around the beginning of September, I’ll be just as ecstatic over pumpkin, squash and apples. This dish is for those of you who love fresh summer produce as much as I do. And, although there are three separate recipes, I promise that it’s not complicated. 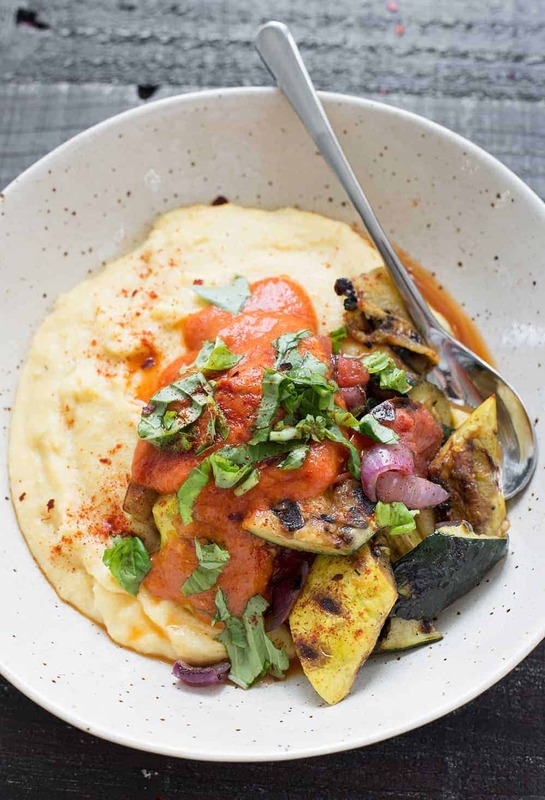 Make the sauce, make the polenta, grill the vegetables. The roasted red pepper-tomato sauce is one of my favorites. You’ll see it again in a recipe for vegetable stuffed peppers, coming soon. As you all know, I’ve a sauce girl. I love condiments, salsas, sauces; wet food is my favorite. If I can dip it, then I probably will like it. It’s why some of my favorite recipes are centered around a sauce. This bowl is no different. What are your thoughts on polenta? I find that it’s a grain that I love, but don’t make often. And then, as soon as I do, I want to eat polenta all the time. Especially with charred, grilled vegetables and a silky sauce. It’s my version of summer pasta. 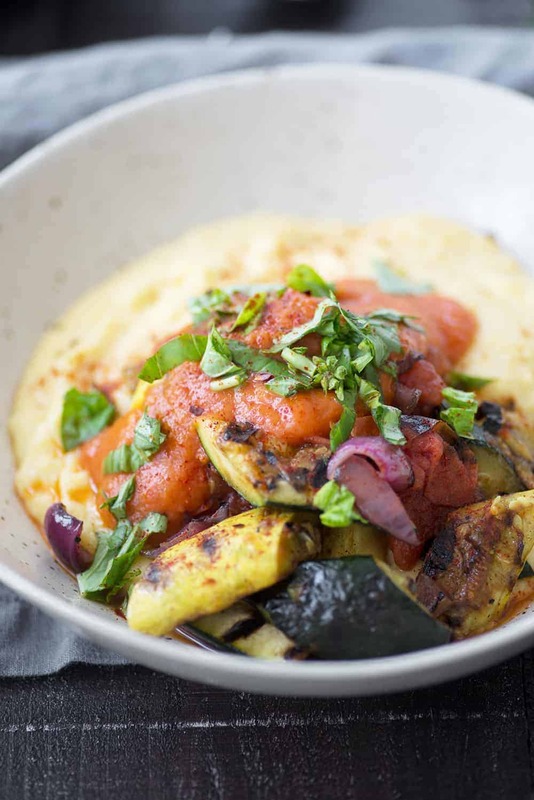 Creamy polenta with grilled summer vegetables and red pepper tomato sauce. 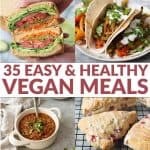 This gluten-free and vegetarian or vegan dinner is SO delicious! 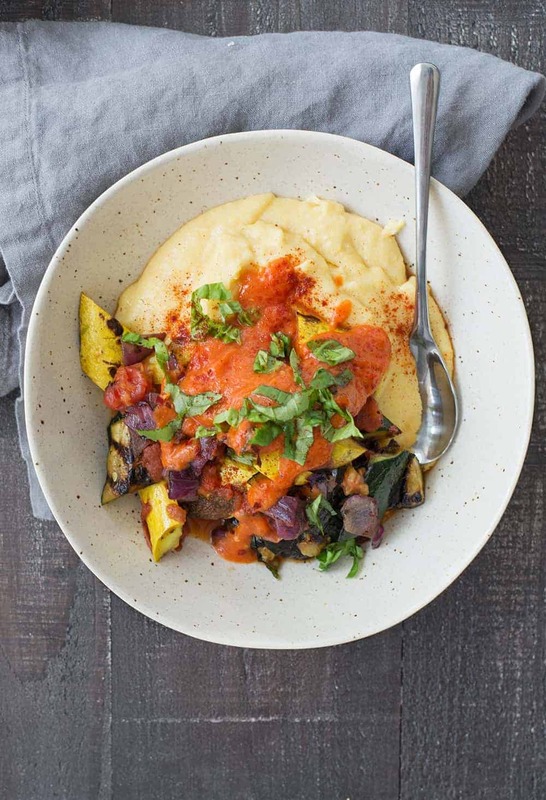 Creamy polenta topped with grilled vegetables and a roasted red pepper tomato sauce. 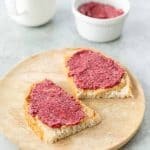 Make the red pepper sauce. Preheat oven to 375 degrees F. Cut off the top quarter of the garlic, lightly rub olive oil on the exposed cloves and wrap the remainder or the garlic in foil. 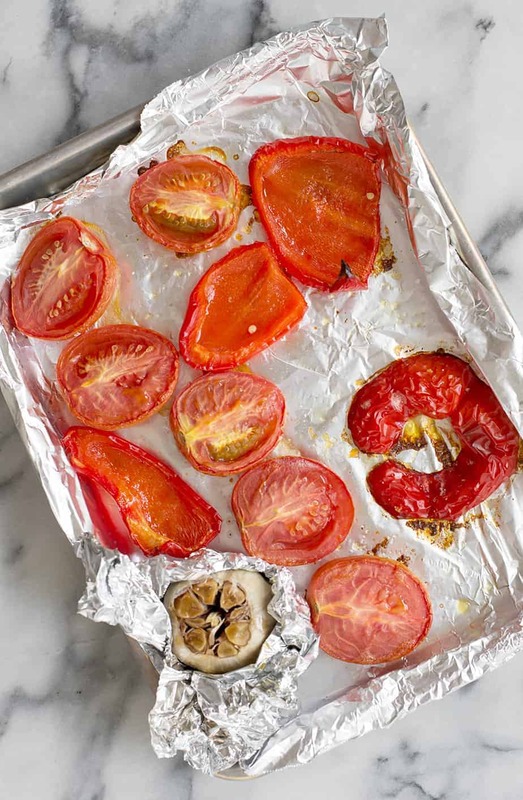 Line a baking pan in foil and add the halved tomatoes, red bell pepper and toss with olive oil. Add the garlic to the baking sheet and roast for 1 hour until vegetables are very soft. Remove the vegetables and discard the stem from the pepper. Place the tomatoes, peppers, lemon juice, balsamic vinegar and salt in a blender. Remove the foil from the garlic and pop out the softened garlic cloves. Puree until smooth, set aside. 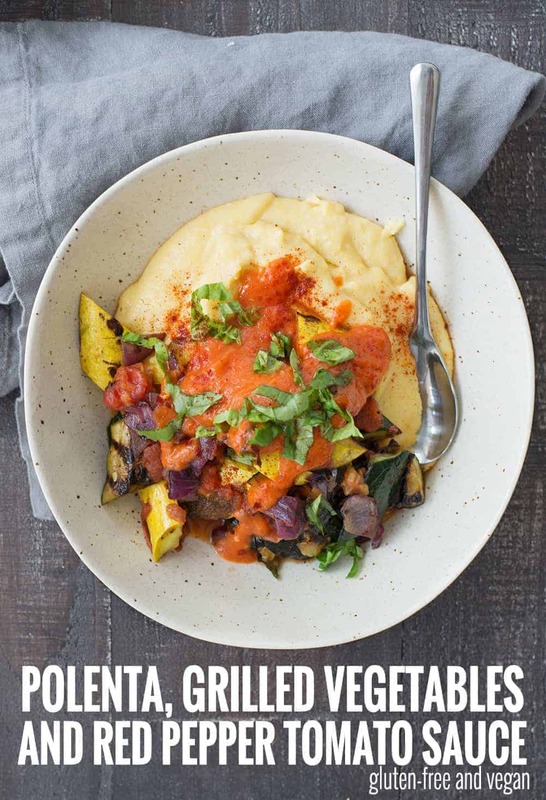 While the vegetables are roasting, make the grilled vegetables and polenta. Whisk together the vegetable broth and soy milk in a medium sauce pan over medium heat. When bubbles start to surface, whisk in the cornmeal along with a generous pinch of salt. Reduce heat and cook until thickened. Just before ready to serve, stir in the butter and cheese, if using. Heat a grill or grill pan over medium heat. Gently rub the vegetables with a little olive oil and place on the grill. Sprinkle with salt and freshly ground pepper, then grill until vegetables are softened and charred, about 2-4 minutes per side. Remove the vegetables and roughly chop. To assemble, divide the polenta among 4 bowls and top with vegetables and sauce.